Sometimes a gun hunter really needs to put a deer straight down. Do you know how to make it happen? The big buck was a rambling guy. And from where I sat, that was no longer a good thing. We all hope to see mature bucks on their feet in daylight, and I was thrilled to have encountered this one on a December morning in the Texas Panhandle. But when a shooter starts out fairly close to the edge of the land on which you can shoot him, and with every second he’s closer to being off it, there’s a limit to just how much movement is a good thing. If this buck didn’t immediately switch off his cruise control, he’d be leaving my life as quickly as he’d entered it. He wasn’t a buck I knew, or even knew of. 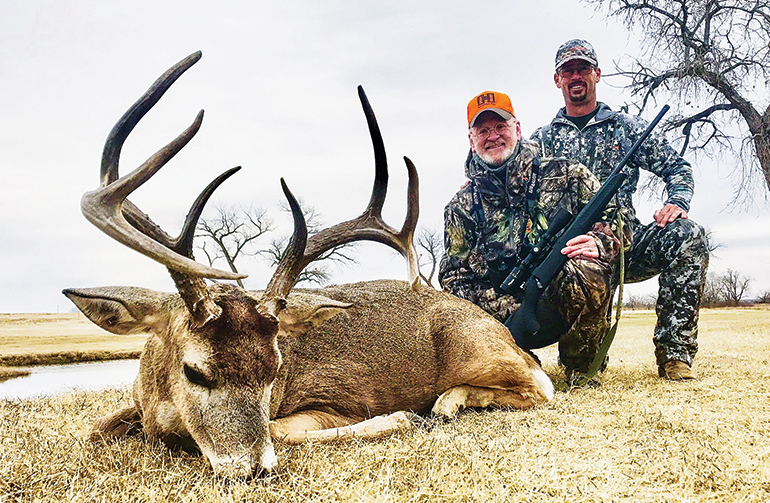 My friend Tye Sims of T Fork Outfitters hadn’t mentioned that I needed to be on the lookout for a really tall 4x4, only that this flat along a small creek through open cattle country was a good place to find a mature buck. But I didn’t need to know this one by name to see he was a shooter. That much was obvious to cameraman Pete Palony and me when the deer popped out of the brush. He’d stopped in easy 6.5 Creedmoor range not long after appearing. However, at that point he was fixated on some urine deposited earlier that morning by a doe, and he’d wheeled his body into a contorted angle upon catching wind of it. But the buck was in the wide open, so I’d simply waited for him to present a better shot. I was confident that as soon as he’d satisfied his curiosity he’d turn and stand broadside. That hadn’t happened. Instead, as critters are wont to do, he’d shifted gears. Eager to head on down the trail, he’d begun galloping toward the fenceline. If he reached it and then hopped onto the neighbor’s place, my chance to shoot would be gone with him. I wasn’t keen on waiting to see if he’d stop on his own on our side of the line. So as Pete followed the buck with his camera, I poked the Thompson/Center Compass through a different window opening in the blind and waited for the deer to get roughly in front of my muzzle. When he did, I bleated loudly several times. He stopped, broadside at 160 yards, and I quickly centered the Sig Sauer scope on his left shoulder. The gun went off, the 129-grain Hornady SST hit where I’d aimed, and the deer fell right there. No need to ask the neighbor for permission to trail this one. Sometimes you really need to kill a deer where it stands. I’m not saying it can’t move an inch after impact, but it can’t stay alive long enough to complicate the recovery process. As in this case, chances at nice deer can easily occur on property edges. But there are other reasons for needing to deliver an instantly lethal dose of lead. They even can exist in combination. For instance, maybe a deer is only a few leaps from a nasty swamp that could obliterate any blood trail. Or you’re hunting near a sizable river that could carry away the fleeing animal. Perhaps you’re on public land, and you fear losing your prize to a less scrupulous hunter who might hear your shot and find the deer before you do. For that matter, heavy rain or snow in the forecast also could make you want to avoid having to trail your prize. In short, many variables could lead you to decide you need to anchor that whitetail in its tracks, rather than be forced to go after it. You realize that if the deer leaves the scene, there’s a chance something will keep you from finding it quickly — if ever. An inexperienced hunter might assume that, due to concerns over recovery and humaneness, the right call is to kill every deer in its tracks. But in many cases, we don’t want to do that. Archery presents such situations. With bow and arrow there’s no ethical shot that will predictably drop a deer on the spot. “Kinetic energy” has become part of the bowhunting vocabulary, but “knockdown power” never will be. As Dr. Clint McCoy explained in our October issue, a broadhead is meant to kill by stopping the delivery of oxygen to vital organs and other tissues. That doesn’t result in instantaneous death. Only by severing the spinal cord or directly damaging the brain itself can an arrow send a deer straight to the ground — and those are never reasonable aiming points with a bow. What about with a gun? The energy released by a rotating bullet or slug introduces something called “hydrostatic shock” into the killing equation, vastly upping our chances of a dead-on-the-spot kill. The ease of hitting an exact aiming point on the animal also helps, as compared to trying to strike a tiny spot with a relatively slow arrow. Of course, that doesn’t mean we can just aim wherever. The only gun shots that can reliably drop deer on the spot are those that damage the central nervous system. At the front end of that lies the brain, and at the back end lies the rump. The best place to aim is neither. Risking the loss of a shot deer is always far worse than just losing a few pounds of meat. Thus, our first responsibility to any animal we shoot is to try to kill it cleanly and quickly. But even with a gun, that normally doesn’t have to mean instantly. We must do what we can to avoid maiming a deer, letting it get away to suffer a lingering death (whether we eventually find it or not) or living out its days as a cripple. This tragedy often is the result of head shots that nearly hit the brain or neck portion of the spine. Shattering lower jaws or blowing off noses is inexcusable. Neck wounds that miss the spine or major blood vessels but damage muscles and ligaments are almost as bad. But rest assured there are Joe Sniper wannabes taking such shots. You hear about the ones that go as hoped, but not about the many that don’t. The “kill ’em dead in their tracks or miss ’em clean” argument is often used by advocates of head/neck shots. Too bad there’s a very real third possible outcome to consider: wounding the deer and losing it. You might be off a fraction. The wind might gust. And, of course, a deer might move between the time you commit to the shot and the time the bullet arrives. Regardless, the result can be game that proves unrecoverable, even if you have the benefits of large acreage and a trailing dog (not universally legal). With a quality bullet or slug, you can kill a broadside deer in its tracks by shooting through the near-side shoulder and into (or through) the off-side shoulder. And if you have the skills, gear and time to be extra precise in your shot placement, hit a bit high in the shoulder. Then the projectile will surely snap the spinal cord while taking out the upper lung area and forelegs. 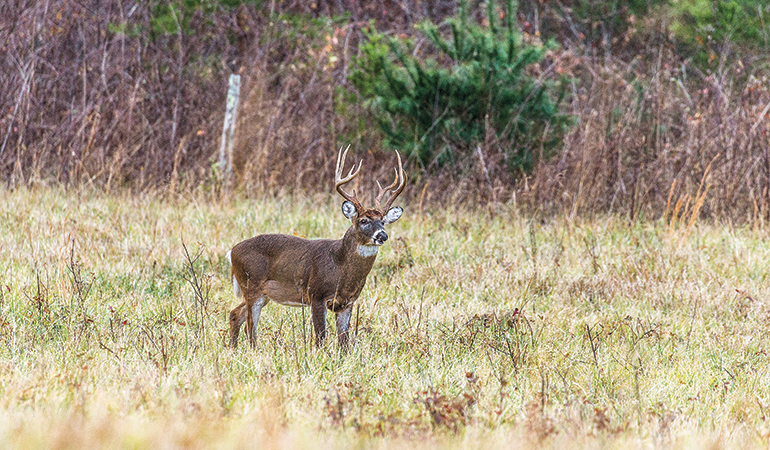 It’s hard for even the toughest buck to shake off that hit. That’s exactly where I struck a mature buck on the second morning of the 2007 Missouri gun season. Cameraman Mike Clerkin and I were hunting at Joe Ream’s Blackbird Creek Outfitters, and our blind overlooked a big block of CRP next to land we couldn’t access. The 9-pointer was heading back to that property from a distant corn field when we spotted him. The deer was beyond the range I was comfortable with, so Mike and I left the blind and took off down a treeline toward him. Minutes later, we looked up and saw the buck about 220 yards away, coming out of a brushy ditch at a fast walk and heading for the fenceline. I stopped him with my voice, put the crosshairs high on his left shoulder and fired. The 150-grain round from my .30 TC smashed him straight to the ground. Minutes later, we shot our field photos right there. The argument against hitting one or both shoulders is that some good venison is bound to end up wasted. The argument against high shoulder is that a bit of the coveted backstrap might well be lost, too. But worry not. With good bullet/slug construction, the projectile should stay pretty well intact, with manageable fragmentation and acceptable meat loss. Nobody wants to lose even a few pounds of trimmings, but consider the alternative. If you kill a deer you can’t recover, every bit of it goes to the scavengers. Someone is thinking, I’ve shot deer in the shoulder with a gun, and they ran off. If this has been your experience, ask what really happened. If you recovered the deer, did you study the damage? If so, you might have seen that you caught just the fringe of the shoulder blade(s), resulting in little skeletal damage. And if you hit just below the blade(s), missing the upper leg bone(s), there wasn’t much bone other than ribs to hit. Such deer should die within seconds, due to lung devastation, but maybe not in their tracks. Combine powerful impact with both shoulders and the spine to see “knockdown power” on full display. I’ve shot whitetails with a fair range of centerfire cartridges. Over the past decade, most were taken with .280 Rem., 7mm Rem. Mag. or 6.5 Creedmoor. I’ve also shot them with .25-06 Rem., .300 Win. Mag., .270 Win., .30-30 Win., 6mm Rem., .30-06 Springfield, 30 TC, 7mm-08 Rem. and I’m sure others that escape my mind at the moment. The one thing I can say that all the above have in common is this: If I hit a deer high in the shoulder blade(s), it falls dead, generally without taking a step. If I don’t, in most cases the deer doesn’t. Using good ammunition accurately delivered, all these cartridges, plus many others, exhibit “knockdown power” on whitetails. To the late Jack O’Connor is widely attributed the quote, “A deer shot in the guts with a magnum is still a deer shot in the guts.” I’d never try to rewrite his words, but I think we’re justified in adding to them: A deer shot just behind the shoulder with a magnum is still a deer shot just behind the shoulder. It’s all but certain to run a bit before dying. Occasionally we find ourselves having to make kill-it-now decisions at the spur of the moment. But more often than not, the conditions leading to such scenarios are known before the deer ever steps out. In fact, they’re often known before the hunt begins. To minimize the risk of a shot deer leaving the property you’re on, common sense says it helps to avoid hunting right on the edge. This is especially true if you don’t know that the neighbor will let you onto his/her property to retrieve a deer. A game warden might be able to persuade the landowner, and in some places the law actually requires that you be allowed access for game recovery. But in most jurisdictions there’s no such law. Even if you can see the deer lying dead a few feet over the boundary, you might not be able to legally recover it. So an obvious way to minimize the risk of losing a deer is to foster good relationships with bordering neighbors. Before the season, try to get them to agree that you can enter for deer recovery, even if that involves having them accompany you. The smaller your hunting property and the closer to the edges you hunt, the more critical such agreements are. Naturally, for this accord to work with a neighbor who also hunts, it must apply to both parties. If Neighbor Bob calls you on opening morning to ask permission to look for a shot deer, you let him. And you need to do so in a timely manner, to maximize his chances of finding the deer in good shape. You’d naturally want the same response from him. I’ve received permission to look for a deer that left a property. I’ve also been denied permission. Life is just simpler when we can avoid the need to cross the line for deer retrieval. We also can consciously stay out of habitats that put a premium on dropping deer instantly. Swamps are a classic example. Of course, whitetails like being near water, and some of the best stand sites are virtually surrounded by it. That doesn’t mean you can never hunt where water might wash away blood, but it does mean that if the deer leaves, you must be able to find it by following tracks, broken vegetation, stirred-up sediment, hair, bone, etc. Blood isn’t the only sign. Finally, keep an eye to the sky. Bowhunters know certain conditions make shooting a deer riskier, with blood and other sign difficult to find and follow. But that point is seldom preached to gun hunters. Perhaps it’s because with a gun in hand, we feel confident that we’ll drop every deer on the spot. Where that confidence comes from is unclear, though. Far more deer leave the scene than don’t. You still must hit them right. There’s a lot to think about concerning the recovery of a gun-shot whitetail. As much as anything else, it’s critical to keep your wits about you. Don’t get so caught up in the moment that you fail to consider the consequences of making the wrong call. If you’re just not comfortable with what might happen after you pull the trigger, simply wait. There will always be another day . . . and another deer.